"Order of prayers for the whole year according to the Arizal Nusach", with "the meaning of the words according to the kavanot of the Arizal", two parts, by HaAdmor HaZaken, Rebbe Shneur Zalman of Liadi (Lyady), the Baal HaTanya. Kopust (Kopys): R. Yisrael Yoffe, a prominent disciple of the Baal HaTanya, 1816. First edition of Maamarei HaSiddur – discourses pertaining to the Siddur (Siddur im Dach). 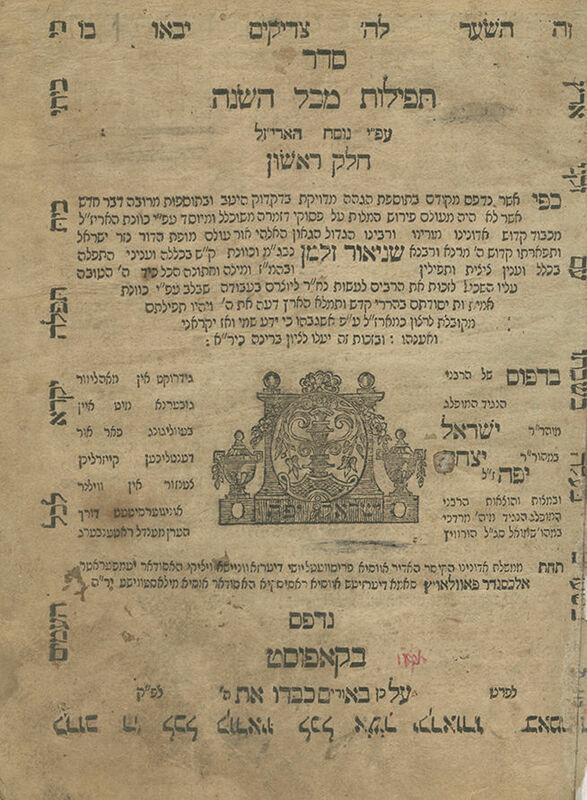 The prayer rite in this siddur, the anthology of laws and the two Chassidic essays (HaKol Kol Yaakov and He'ara LeTikun Chatzot) were composed by the Baal HaTanya, and printed in his lifetime in several editions. This is the first edition containing his essays on the meaning of the words of the prayers according to Kabbalistic and Chassidic teachings, which did not appear in preceding editions. These essays are based on discourses delivered mainly on Shabbat eves, before his sons and several elite disciples. The discourses were recorded and brought to print by his son R. Dov Ber Shneuri, known as the Mitteler Rebbe of Lubavitch (Lyubavichi). This siddur is known amongst Chabad followers as Siddur im Dach (Divrei Elokim Chaim – words of the Living G-d). Some of the discourses were recorded and edited by R. Dov Ber in his own style, with the addition of explanations and expansions, and some of the essays are a verbatim transcription of his father's words, without any of his own additions, "his words as they are, without any additions or omissions". In his foreword, R. Dov Ber describes the system of recording his father's discourses. He writes about the discourses which he edited and expanded upon, how he reviewed them time and again, to ensure they are understandable and accessible to all ages. Conversely, the discourses transcribed verbatim, regarding the meaning of the words of the prayers, from HaShamayim MeSaprim until VaYevarech David, were edited by the Rebbe himself, who was delighted with them, as they are written concisely yet contain much for those who comprehend the allusions. A large portion of the essays printed in the siddur are discourses on the Zohar said by the Baal HaTanya regularly on Shabbat eves. His son writes regarding these discourses that it is plainly obvious that the Rebbe benefitted from Divine inspiration, revealing to him the hidden realms of the Torah (foreword to Biurei HaZohar, Kopust, 1816). The printer and editor, R. Yisrael Yoffe (1740?-1828), was a prominent disciple of the Baal HaTanya, who exchanged profound correspondence with his teacher on topics of service of G-d. In his later years, he immigrated to Eretz Israel, settling in Hebron. His grandson, R. Chaim Yosef David Azulai (a disciple of the Tzemach Tzedek) described him as an eminent Torah scholar, a great Chassid and one of the first Chassidim attached to the Baal HaTanya. The Baal HaTanya entrusted R. Yisrael Yoffe with the task of publishing one of the editions of the siddur, directing him with oral and written instructions. The latter acclaimed this prominent siddur on the title page: "Underwent meticulous and precise proofing". Two volumes. Part I: , 104; 54 leaves. Part II: 68; 99 leaves. 19.5 cm. Vol. I: Most leaves in good condition. Stains. Light wear and signs of use to some leaves. Minor worming to title page. Worming to four final leaves. Damage and a few minor tears, almost not affecting text, repaired with paper. Leaves trimmed close to text, affecting headings of several leaves. Printing defect on leaf 41, affecting several words. Vol. II: Fair condition. Stains and wear. Tears and worming to title page, its verso, and other leaves in middle and end of book, with damage to text, repaired with paper (many leaves professionally restored, most leaves without extensive damage to text). Inscriptions. One detached leaf. Some light-blueish leaves. New leather bindings.